This is my home until family arrives. It's a quiet place except for the banging halyard on the Leopard Catamaran in the adjacent slip, the occasional horn from a departing cruise ship, and the few hundred talkative seagulls that hang out here. I have been doing a lot of nothing and enjoying the time to recuperate after a long driving haul from Little Rock. Another cold front is passing through and keeping the temperatures cool. Arkansas is having warmer weather than Nassau! How does that happen? The Maine cruiser's, "Southern Grace"
We arrived in Key West at daylight after an all day and night sail. The weather was pretty good throughout. We anchored in the middle of a squadron of about 20 boats. The captain of our nearest neighbor dingied over and gave us a little lecture about being too close and to warn us of the bad holding in the anchorage. 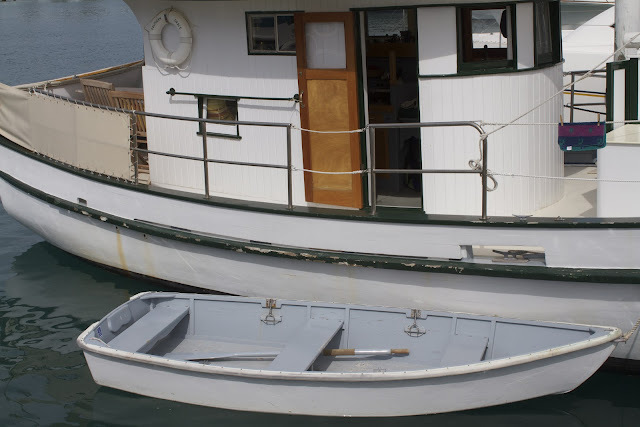 Then he glanced at the boat and said,"whoa! what is this? its built like a friggin tank!" Ha, yes it is. I storm was brewing to our west and unfortunately for us, we were exposed on that side. Just before sunset a white squall slammed us hard. The boat pitched heavily in the wind all night long. John said he got airborne several times during the night(he was sleeping up in the bow). I was in the aft cabin and maybe got two hours sleep. We were all too ready to weigh anchor and get moving in the morning. 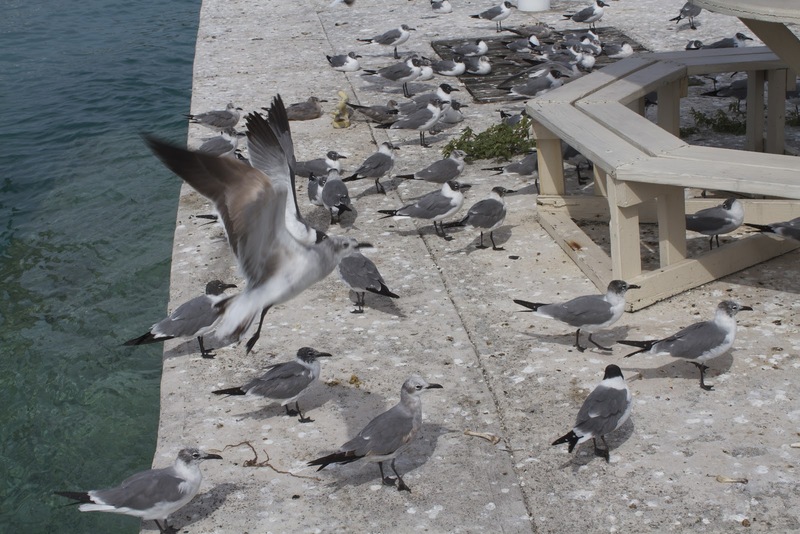 I had originally wanted to enter the Bahamas via Cay Sal Bank on the southern end but now that the north wind blew the only way to stick with the plan was to wait it out in Key West. We would lose valuable time doing that. So we came up with an alternative to keep us moving closer to the goal. We were going to work our way up southern and eastern side of the keys. They would provide protection as we made our way up to cross over to North Cat Cay just south of Bimini. Our plan today was to make Bahia Honda State Park 33 miles away. The sail was surprising nice considering the cold north wind. We trolled with deep diving crank baits along the way and managed to land three nice grouper in 12 feet of water. We make anchor around 4:30. The park is written up as a very nice place to camp. It looked inviting from the boat. We left Bahia Honda State Park for Islamorada on a long 45 mile sail. The wind picked up in the afternoon and we made 8.6 miles per hour in a strong North breeze. I reserved a slip at Smugglers Cove Marina and we made the very tricky entry into the tight marina entrance without crashing into the other boats. I still have a ways to go before I feel confident in my docking ability. A very tight entry into Smugglers Cove Marina. It was a fun lay over. 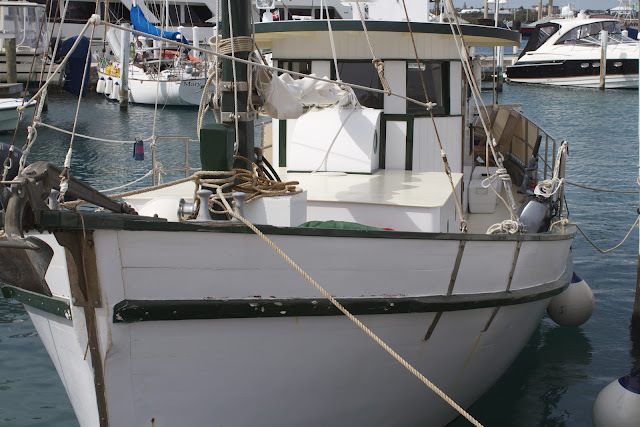 The next day we prepared the boat for the gulf stream crossing. We moved the masthead a little more forward to try and stop the excessive weather helm and cleaned up. We were planning on making our move in two days but we met a very experienced fisherman named Russ who said tomorrow would be the day to go. I met Russ in the bar later that evening and I milked him for all I could on fishing in the Bahamas. He was more than happy to tell me what he knew. 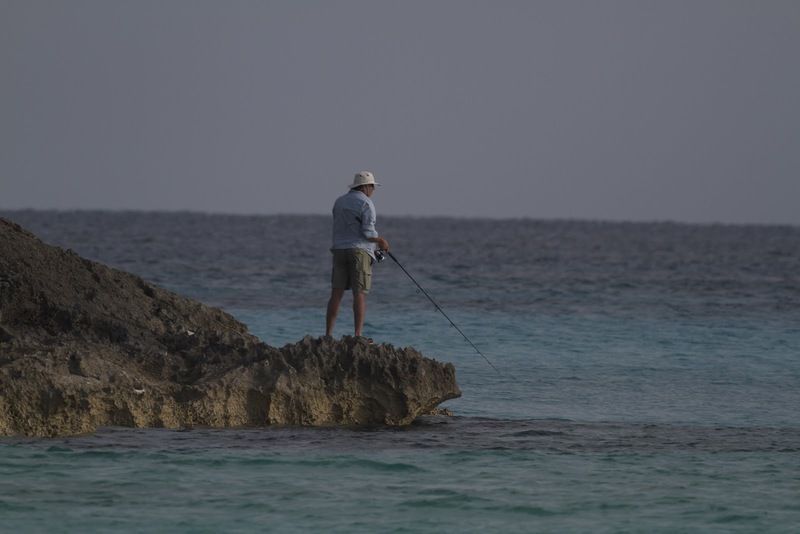 Russ had been fishing the Bahamas for a while and had seen it all. We left Smugglers Cove for the Bahamas at 8:00 am and I grounded the boat again leaving the marina. I just can’t seem to keep Mary Annie off the bottom. Russ said the crossing would be good and it was. We motor sailed the entire trip of 82 miles to keep our speed up. When we entered the Gulf Steam we encountered large swells that were left over from the strong North wind two days previous. It was exciting. We caught one Mahi Mahi along the way which provided us with two delicious meals. We made anchor at 8:30 pm on the south side of South Cat Cay. This was a beautiful and protected anchorage. The next morning we had to make some decisions. We had another long 76 mile run to Chub Cay. John seemed to want to leave today. I was wanting to rest up in North Cat Cay Yacht Club before we left for Chub Cay. We decided to clear Customs at the Yacht Club and ask about the trip over to Chub Cay. We cleared customs without a problem and decided to stay the night and sail to Chub Cay in the morning. We met a very nice gentleman named Ivan who was bartending at Bu’s Bar. We didn’t get our much needed rest at the club as the wind shifted and slammed us all night at dock. We were up several times during the night trying to keep the boat from being damaged. Taking a siesta at North Cat Cay Yacht Club. Rift raft like us had very restricted access to this private island, but we had fun here and met a fun bartender named Ivan. We left for Chub Cay around 8:00 am and had our best sailing of the trip. We averaged close to 7 knots. We also caught 3 cuda along the way. As we sailed into the night John turned off all the monitors and we just sat back and watched the stars as we sailed. The night sky out here is amazing. It was a special day. We made anchor at Chub Cay around 10:00 pm. It is an easy entry even at night. The next morning we motored for 4 miles to a place called Fraziers Hog Cay. 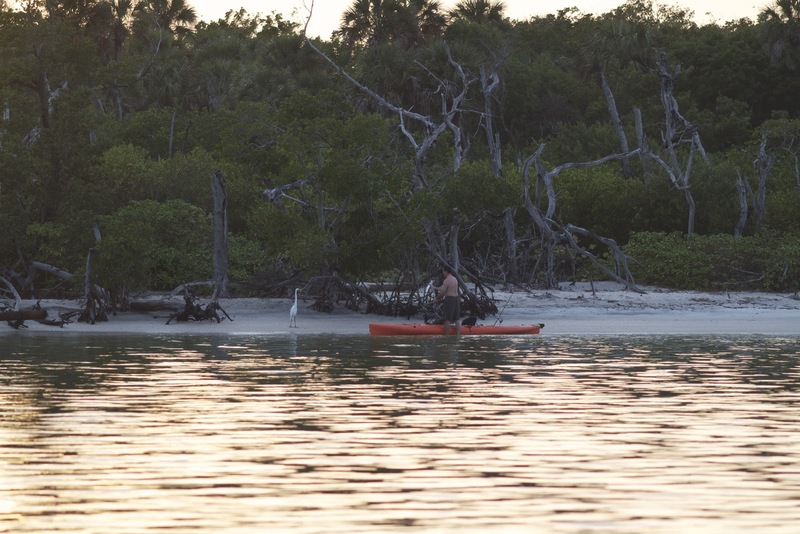 We motored up a channel and anchored in a nice spot to kayak and fish. We caught a large cuda upon entry and decided to keep it for chum. We hung it over the side of the boat for tomorrows fishing. That night as we watched a movie, we heard loud thrashing outside by the boat. A large shark had taken the cuda right off the side of the boat. The next morning we motored along the 600 foot depth line trying to catch some tuna and mahi mahi with no luck. We turned to anchor midday in the most beautiful spot on Whale Cay just off the Whale Point lighthouse. We got the kayak out and I hit the bank for some fishing along a wild and beautiful coast. I managed to catch a large cuda which would become bait for some shark fishing later on that night. 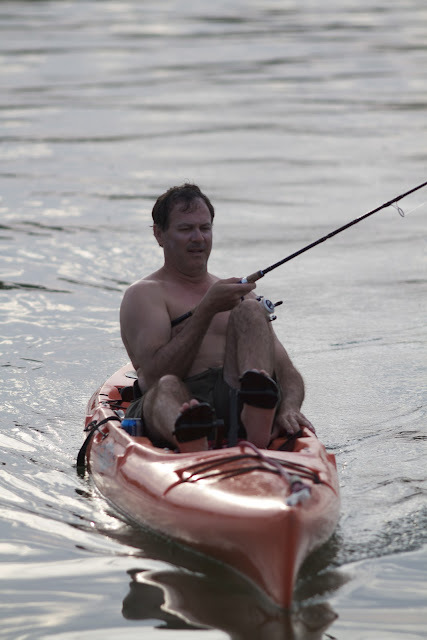 John later did some kayak fishing and brought back a nice snapper for dinner. I hooked up the cuda before dark with a large shark rig and dropped him in. Five minutes later the reel started screaming as a large shark had engulfed the 20 lb cuda and was headed to deep water. I manned the rod and reel and watched the 50 lb test line spool. I cranked down the drag to keep from getting spooled and turned to John and said we weren’t landing this one. Then the line snapped. John looks at me and said we need a bigger boat. It was chilling. 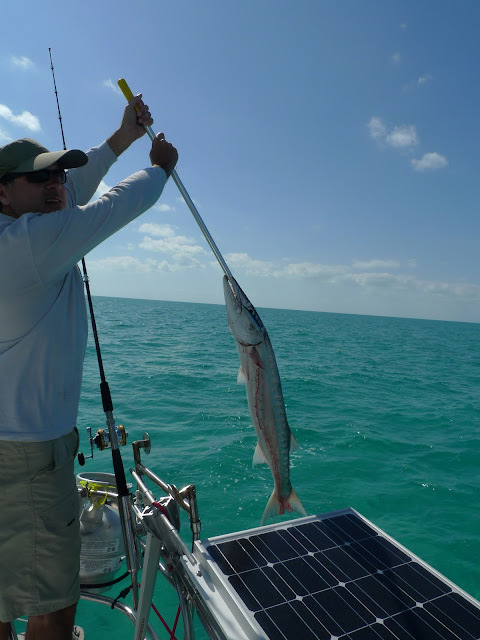 The barracuda is our bait for shark fishing. They can't resist them. We pulled anchor early in the morning for our 33 mile trip to Nassau. We rigged the fishing gear in hopes to land something along the way. The sea was especially rough that day and we were wondering why we didn’t check the weather before we left. Little did we know the US embassy had issued a warning that day about the dangerously large swells that were coming in from the Northeast and told residence to stay off the beaches and out of the waters. We soon were sailing in 20 foot plus swells with confused seas. It was an incredible display of power as these swells swept across us at 30 miles per hour. Now I know experienced blue water sailors would yawn in these conditions. But a river rat from Arkansas that has never sailed in the ocean before this trip found it quiet exciting. 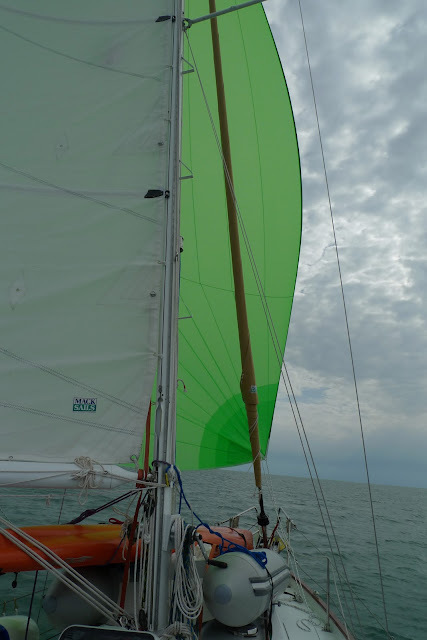 We were sailing with a reefed jib and motoring at 1200 rpm just like the Rasmus manual said and the ride was really comfortable for the conditions. The boat handled it well. We never felt in danger but we were also aware that the conditions would get worse as the sea shallowed up upon our entry into Nassau Harbour. At 5 miles out from Nassau, we could see the huge breakers slam the shore and wash up into the streets of the city. It was an anxious time. As we neared the harbor entry point, we rode up the side of three large 25 foot swells that broke just 50 yards to starboard of the boat. We kept as close to the port side as we could to keep from getting caught on the breaking side of the swells that could potentially wash us into the shore. John was steering the boat at this point and did a perfect job in navigating the dangerous conditions. We made the harbor in one piece and were soon tide up at Hurricane Hole Marina. John had said he wanted challenging conditions at least one time on this trip. We got them. The locals were all talking about all the sand and debris that was covering the streets of Nassau that had been pushed in by the breakers. I had to say goodbye to John Thomas today as he flew back home for more responsible business. I can't thank him enough for joining me in Sarasota and sailing to Nassau. I don't think I could have made my schedule without him as solo sailing is a lot more tiring than I had anticipated. I learned a lot about sailing form him along the way. He is a great sailor, teacher, and now good friend. Thanks John, we make a good team. Here we will wait for family to come in for a visit in a week and then my brother Pete the next week when we will then explore the Exumas for a month. I woke up to a very nice day anchored off of Longboat Key and near Moores Crab House. I was still very tired from the overnight trip down but also excited to have John Thomas, a sailor from Little Rock, join me all the way to the Bahamas. I had become so exhausted on the trip that I started to wonder why I was doing it in the first place. Having John on board to share the trip with and the handling of the boat will be nice. We left Longboat Key for Venice Florida via the Gulf of Mexico. The weather slapped us in the face with some confused seas at the start of the trip but calmed down as they day progressed.. We arrived in Venice just before sunset to a wonderful anchorage just inside the passage. We both really like the looks and feel of Venice. The next morning the wind was blowing hard from the south and would make the trip hard if we took the Gulf route so we decided to do the ICW. It turned out to be a great decision. The trip was interesting and relaxing. We had to raise around 7 bridges on our way, all reached on channel 9. The weather built as the day went on. We were trying to anchor off of Cayo Costa State Park. We arrived around 4 in time to get the kayak out and catch some fish. The next morning we sailed the Gulf to Marco Island. It was a good day of sailing but long. We arrived at Marco at night and I had to do another night passage through a narrow pass into the harbor. We hooked up around 7:30 pm. We stayed two nights and had time to relax, do some laundry, and fill up on good food at the tiki bar. I tried to order a new prop to replace my damaged one with no luck. It would have to do. 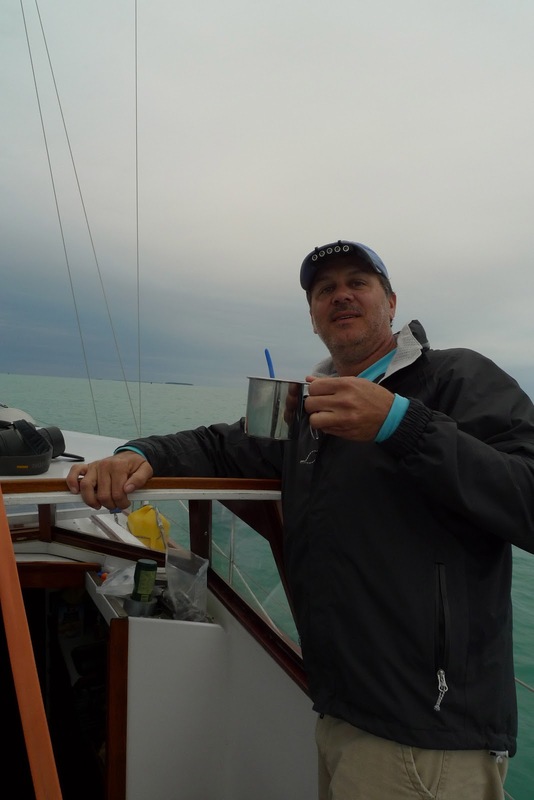 The next morning we were headed to Key West on an overnight sail of 87 miles. We had great weather and our first dolphin to ride the bow wave of the boat. Our anchorage in Key West turned out to be very bumpy as the wind shifted to the north and rocked the boat all night long. Neither of us got very much sleep that night. We had some decisions to make at this point. 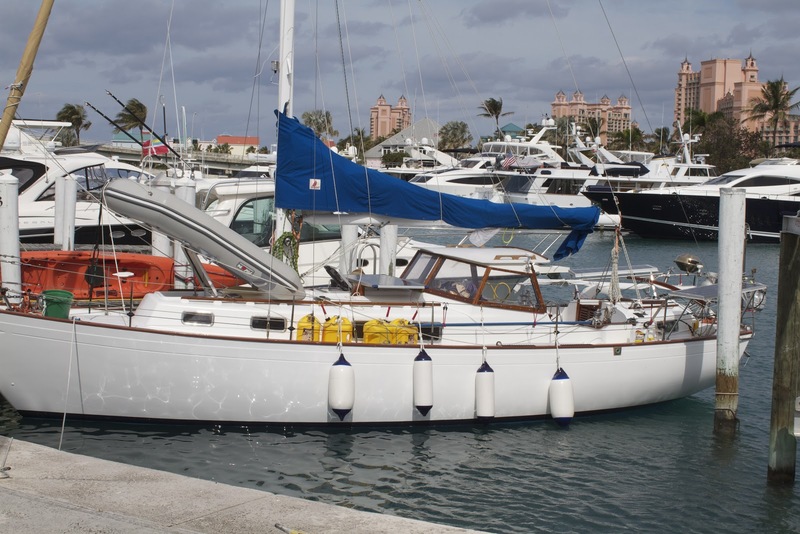 My original plans were to sail to Cay Sal Bank and into the Bahamas on the south side of Andros. The weather was not going to let us cross the gulf stream safely for the next three days. So we decided to work our way up the Keys to gain some ground and at the same time give the weather time to change in our favor. 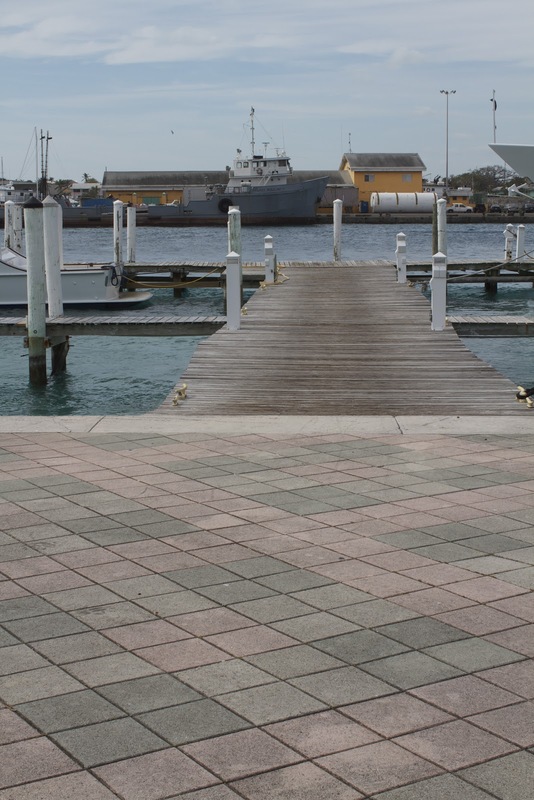 So we decided to leave the next morning and head up the keys on the Atlantic side and position ourselves for the crossing over into the Bahama Islands.